Solar Impulse took to the skies Wednesday on a 26-hour test flight. 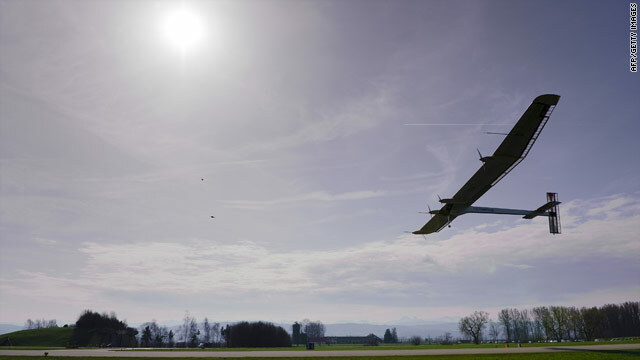 London, England (CNN) -- A solar-powered aircraft, which a team hopes will one day circle the globe, completed a 26-hour test flight in Switzerland at 9 a.m. (3 a.m. ET) Thursday. Solar Impulse took off shortly before 7 a.m. Wednesday from an airfield in Payerne, 80 miles northeast of Geneva. The plane was piloted by Andre Borschberg, who flew to a height of nearly 28,000 feet (8,500 meters). "I've been a pilot for 40 years now, but this flight has been the most incredible one of my flying career," Borschberg said, according to the New York Times. "Just sitting there and watching the battery charge level rise and rise thanks to the sun. I have just flown more than 26 hours without using a drop of fuel and without causing any pollution." During the evening, the plane slowly descended to an altitude of 4,500 feet (1,500 meters), where it remained for the rest of the night using battery power. An hour before dawn, the plane still had six hours of flying time left in its solar-fueled batteries. Solar Impulse has a wingspan of more than 206 feet (63 meters) -- the same as an Airbus A340 -- and is nearly 72 feet (22 meters) long. It weighs about 3,500 pounds (1,600 kilograms) and has nearly 12,000 solar cells attached to its wings and horizontal stabilizers. The plane is equipped with four electric engines and has a top speed of about 43 miles (70 kilometers) per hour. "The goal of the project is to have a solar-powered plane flying day and night without fuel," said the co-founder of the project, Bertrand Piccard. The Swiss adventurer, who piloted the first nonstop balloon flight around the world in 1999 in the Breitling Orbiter III, said the test flight was "crucial for the credibility of the project." The challenge to fly a solar plane around the world was announced in 2003. With the success of the test flight, a second airplane will be designed to fly much farther next year, with the aim of flying across continents and the Atlantic Ocean. In 2012, the team hopes to fly Solar Impulse around the world in five stages.